Michael Warren has been teaching voice in New York for over 30 years and currently runs his Private Vocal Studio on the Upper West Side of Manhattan. Michael offers private lessons to singers of all genres including Opera, Musical Theatre, Jazz and Pop. 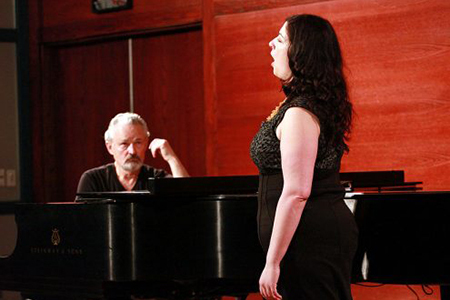 Michael’s Vocal Studio encompasses a wide variety of singers. They range from emerging professionals to world-class singers at the peak of their professional careers. Michael adopts an approach that builds on existing strengths and results in a healthy vocal technique. With highly advanced students, he works on the fine-tuning of excellence needed for the world stage. Michael’s technique can best be described as “maintaining and developing vocal excellence by building on the natural function of each individual voice.” Michael adopts a personalized approach for each singer. The starting point of his technique is to find the beauty in every voice and bring out its natural quality and strength. He then works to develop this same quality and strength throughout the registers of the voice. This technique applies to all genres and styles and results in vocal freedom that allows the singer to discover their own musicality and vocal style. “The girl in 14 G” Mix, belt, opera, and jazz all in one song!